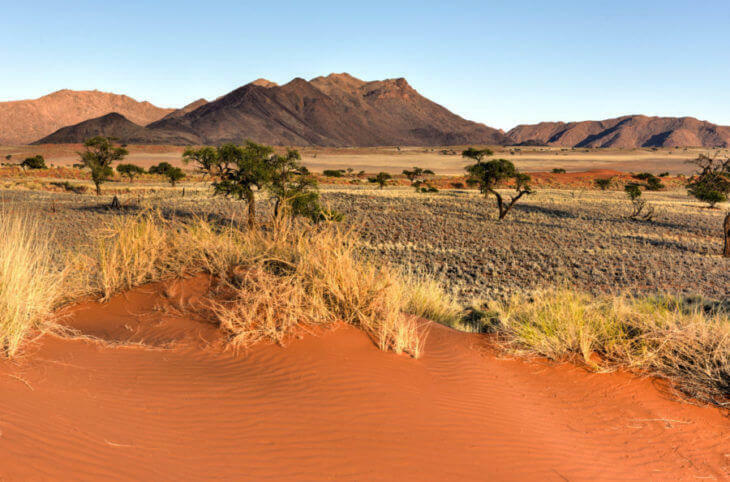 The southwestern African country of Namibia is a vacation spot with a lot to offer, and anyone interested in experiencing Africa should definitely check it out. With beaches on the Atlantic Ocean, and English as an official language, there are plenty of options for English-speaking tourists looking to experience Africa on their vacation. So, what should you expect while visiting? Here are some things that we think stand out. Lots of tourists in Namibia choose to do self driving tours around the country. This is a great way to see the country, and take in the local feel without being caught in the tourist trap areas. However, know that when you’re driving around the wilderness you’ll see things you might not expect… like lions walking across the roads. Don’t worry though, just wait for them to cross, get some great pictures, and continue exploring. It’s all part of the fun! Namibia’s unique landscape makes it an ideal safari location. It has golden dunes, a coastline with beautiful beaches, mountains and wetlands. All populated with amazing wildlife, completing the picturesque scene. When you do a safari in Namibia, you’ll get the experience of a lifetime, and memories and stories that you’ll never stop telling. With wild dogs, zebras, buffalo, wildebeests and lions, nature lovers and adventurers will find themselves in love with a Namibian safari. Since so much of Namibia is sand dunes and desert, many companies offer tours on quads, jeeps and dirt bikes. For those with a bit of an extreme bent, these tours are a great way to see this amazing country. Lots of people have seen the African landscape on a standard safari, but you can do it in style, ripping through the desert in your quad. If you’re even a little bit interested, we highly recommending checking out one of these tours. It’s a very unique experience that you’ll never forget. Namibia has several native groups, a large German population from its time as a German colony, and lots of Dutch influence from it’s time as a South African colony. All this is to say that it’s an incredibly diverse region with lots of cultural influences all creating a delectable local cuisine. With plenty of great game meat, and lots of amazing local chefs, anyone looking for food will be very happy while in Namibia. Make sure to check out biltong and potjiekos, and don’t forget to try some of the seafood. The country’s Atlantic coast provides fish lovers with plenty of options. All that being said, the main thing to expect in Namibia is a life changing experience, friendly locals, fun times and memories to last a lifetime. Namibia is a beautiful country, with something to offer to the whole family. If you have an inkling to visit an African country, Namibia is a great place to start. We love it there, and we know you will too.